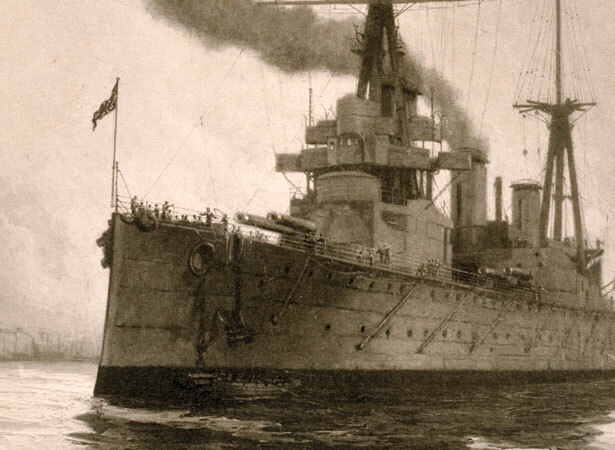 In the misty North Sea on the last day of May 1916, 250 warships from Britain’s Royal Navy and Germany’s High Seas Fleet clashed in the First World War’s greatest and bloodiest sea battle. Among them was HMS New Zealand, the battlecruiser the Dominion had gifted to the Royal Navy. Outgunned and outnumbered, the Germans inflicted more damage on their opponents but returned to port, leaving Britain in command of the high seas. Britain lost three battlecruisers and Germany one; both fleets lost smaller cruisers and destroyers. Six thousand British and 2500 German sailors died. Among them was one of the few New Zealanders serving with the fleet – 21-year-old Leslie Follett of Marton, a stoker on the battlecruiser HMS Queen Mary. Follett died when the Queen Mary exploded after German shells struck it. HMS New Zealand survived with only light damage. The ship’s good fortune was attributed to the presence on board of a lucky piupiu and hei tiki, which had been bestowed during the battlecruiser’s visit to New Zealand in 1913 (see 12 April). We have 21 biographies, 40 articles, related to HMS New Zealand fights at Jutland.